I know it have just been three articles on this blog in January so far and I am terribly sorry: Work was plenty and I took off for a 10-day-vacation on the Canary Islands to gather some new energy for this new year. 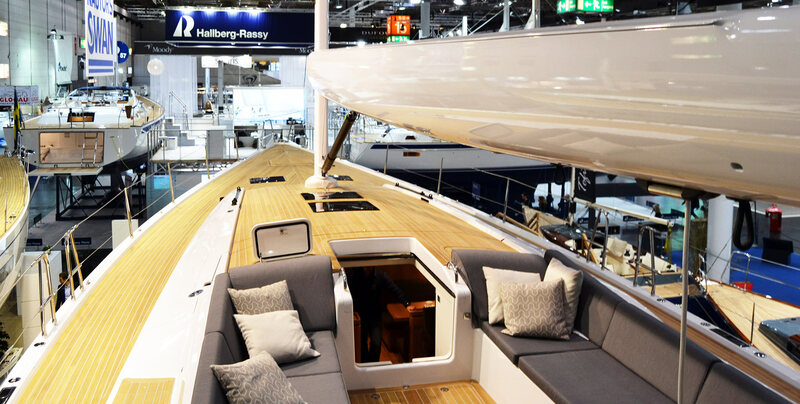 But now I am back with full force – after the BOOT Duesseldorf boat show, the world´s leading trade fair for yachts and boats, I do have a dozen new articles and great boats to talk about. 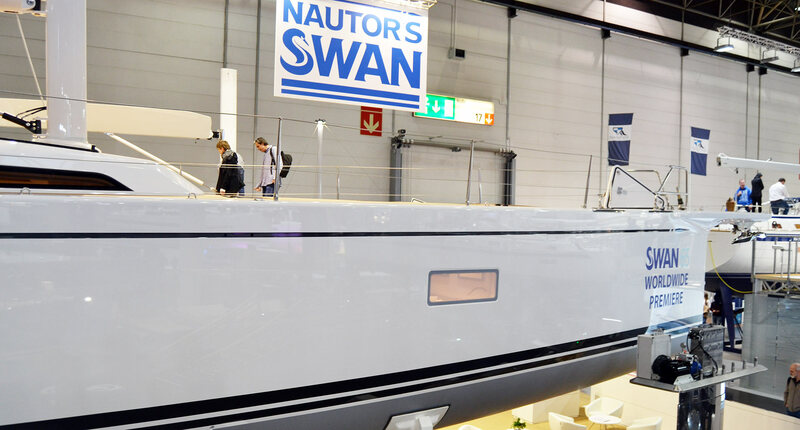 The first of which may be this beauty: The all-new Nautor´s Swan 65. This yacht was apparently one of the larges sailing yachts to be shown at the fair and has drawn a lot of interest. 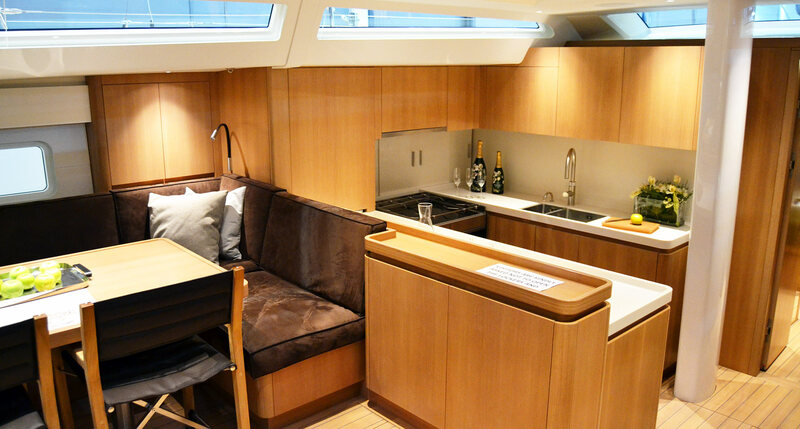 Whereas the new Swan 65 had been here last year, it was mere a mock-up of her interior. Now the real boat could be visited and I was very keen on setting my feet on the new German Frers-creation. Swan has made a huge transition from a classy luxury cruiser to a performance-oriented brand in the last 10 years or so. The designs get more and more aggressive and the clear emphasis on quick sailing is visible in every line of the boats. 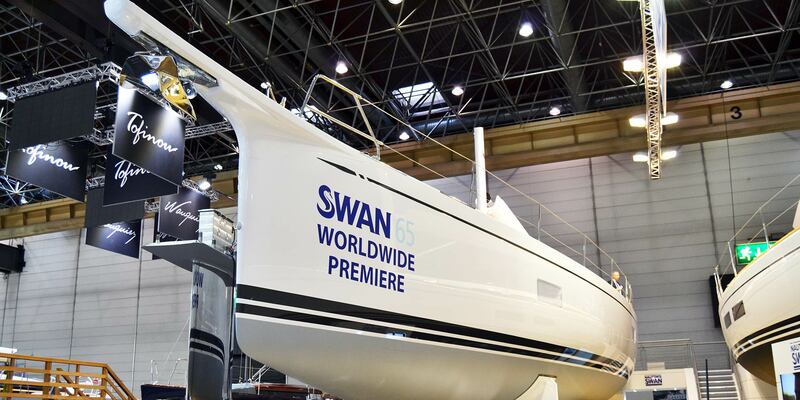 The new Swan 65 is a new breed though, I would say, which one could nicely observe when comparing the 2018-designed Swan 65 to the somewhat older Swan 54 that was presented right next to her. Almost no visible sheer line, very modern, clean lines. With little more than 20 metres length over all and a max beam of 5.62 metres the new Swan is a huge boat for sure. But her relatively low hull and the sleek, barely noticeable sheer lines make her appearance very clean and modern. German Frers has made a timeless classic – for my taste a bit too clean and far off, because I felt this boat lacked … passion. Don´t get me wrong: She is a tempting beauty, but I couldn´t spot any proprietary Swan-like features in her design which was somehow keeping me from attaching to this boat. 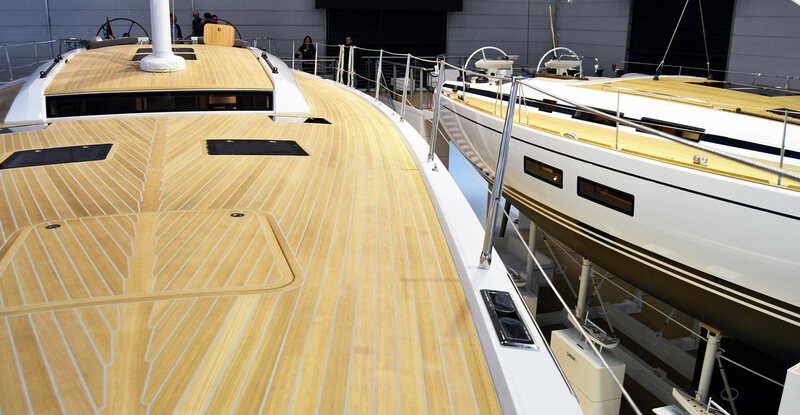 Look at this huge clean deck … and how small the Swan 54 next to her appears. Impressive for sure is the large clean flush deck in the bow area. All lines and sheets are below decks and there is absolutely nothing visible here. It ought to be a pure bliss standing at her helm and looking over this long, low profiled coach roof to the Teak-covered bows. The Swan 65 is built for a couple of two which can – as the yard says – sail and control the boat easily. Of course, she is rigged to be sailed by pushing buttons. 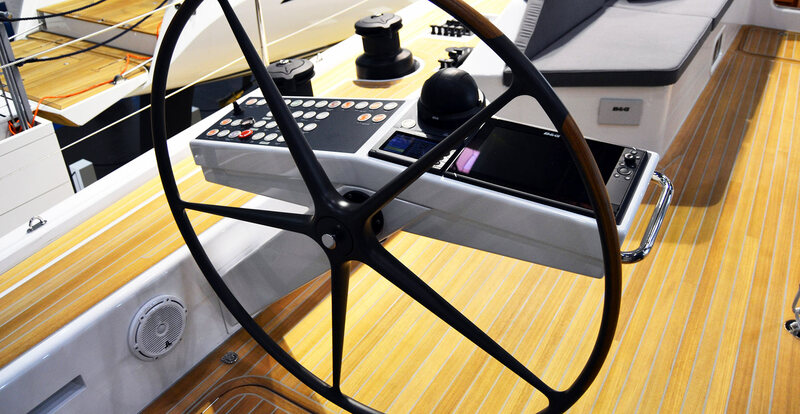 Standing at her helm I admired the slim steering posts which remind me of Star Trek – The Next Generation. For myself I would certainly skip all this fancy stuff and have the boat sailed by hand (well, except for the main halyard winch), but that´s just my personal opinion. INow that I am back home I am a bit puzzled about seeing the winches mounted exactly in a longitudinal line which makes me wonder how the lines will reach the Genoa-winches in the aft. From other yachts I am used to having the Genoa-winches positioned slightly more outwards from the working winches, but I guess Nautor and Frers know what they are doing. Huge winches, note the winch-buttons in the deck to be operated by foot. I was particularly excited seeing this huge clavier of massive jammers which are a beauty in themselves. 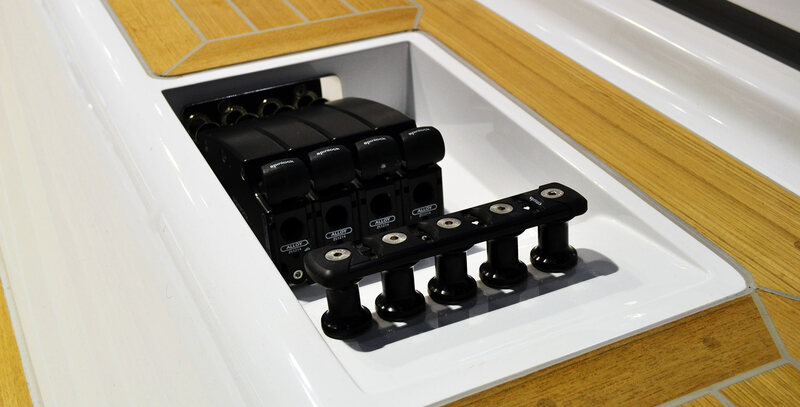 It´s an exciting thing anyway to be roaming these high-class yachts in comparison to the more affordable production boats and looking at these details like jammers, winches and cleats. Anyway, I wonder what will happen when the last of the sheets is taken out of the sheet-tracks running underdeck. Are there trained mice to get in new lines? Instead I guess there are some openings to thread in new lines. Judging from the outside appearance, the wide and open “working” deck from where the boat is sailed, by the low – very low – coamings and coach roof, this yacht wants to be a racer. 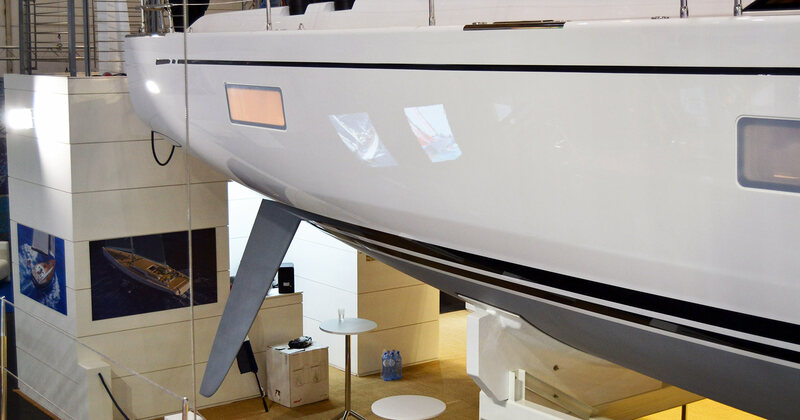 Her sleek hull is a light to moderate displacement design capable of high speeds and thus quick sailing. Let´s go down and see how the modern Swan-approach is maintained below decks. And of course, the quality of the build, the level of craftsmanship and the quality of the materials is beyond any doubt. Where above deck the Teak-works are just spotless and marvellous, this approach to finishing quality goes on when you go down the entryway. (Which, by the way, was a bit too steep for my taste). The salon is just huge. The whole room measures more than 5 metres in length and comprises two levels. 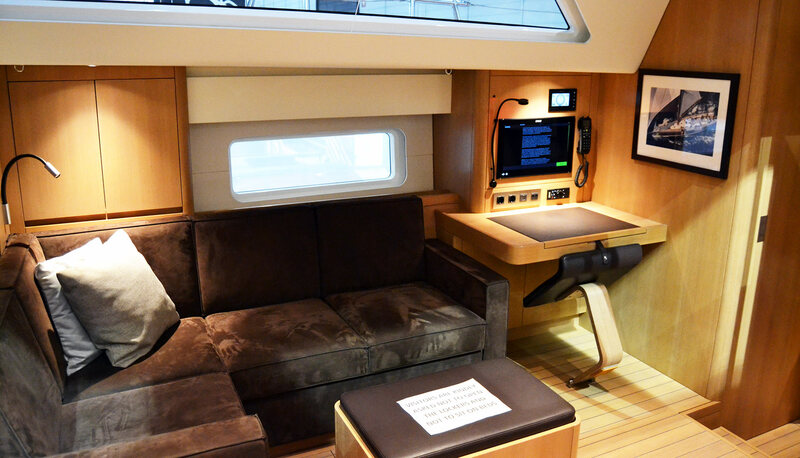 The slightly raised “main level” right after coming down houses the nav station with a chart table to starboard side and a large dining table to port side. Right at the main forward bulkhead the galley is positioned – one level down. I liked the galley – a large U-shape, big enough to provide more than enough stowage for food and stuff with a corridor in between that is slim enough to act as safe wedging for the ship´s cook in rough seas. 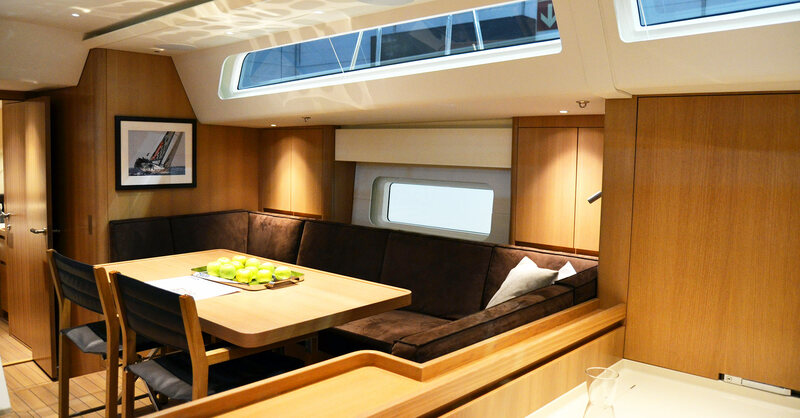 Sitting at the large dining table one can look outside through the huge hull windows and because of the fact that the galley is somewhat 20 centimetres down on the lower level the guests don´t have to look at dirty dishes all of the time. Nice. Snug dining area, very cozy. 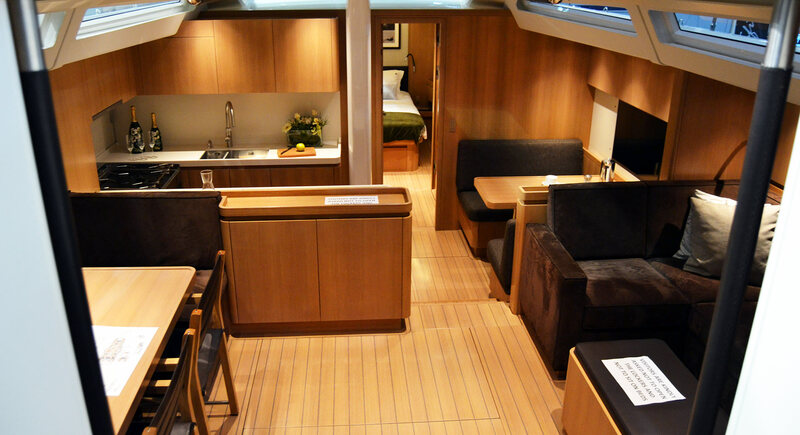 A secondary “Coffee Lounge” to starboard side. In front of the Coffee Lounge, facing the dining area, there is yet another lounge, this time it´s an L-shaped settee around an even smaller … well, coffee table. 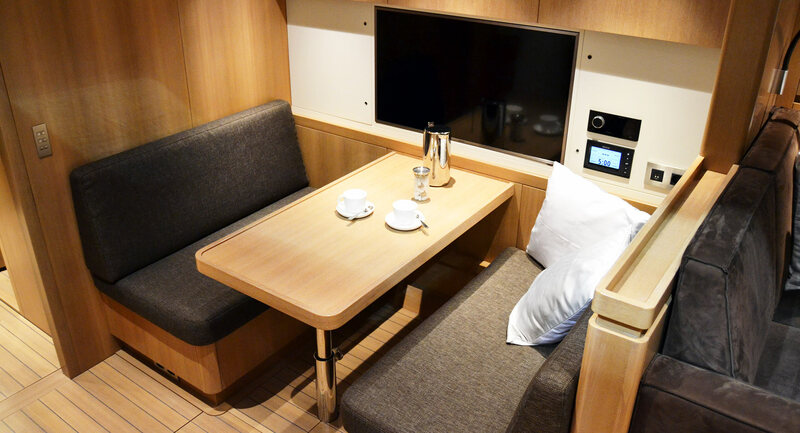 The lounge is directly adjoining the chart table which in itself is surprisingly small and feels a bit cramped into the edge to the starboard side bathroom. And I would say that it is this confusion that is showing the dilemma in which the interior designer of yachts may find themselves especially when they do the big boats: How to utilize this huge volume? And a third lounge in front of the (tiny) nav-station. From my personal point of view, the new Swan 65 shows exactly this “cluelessness” as I would call it: Offering no less than 3 areas in this one salon where people can sit down, have a drink and a chat and relax is ridiculous in my eyes: Who needs so many tables and sofas? That´s my biggest critique on this boat, I really pity this layout of the salon because I don´t feel that the volume that was available has been utilized properly. Instead, the salon is peppered with different areas offering exactly the same. Don´t get me wrong: The boat is a beauty and each area in itself is nicely done. It is perfectly fine to sit down in the coffee lounge, I can imagine how cool it must be to drink the first morning coffee here, sitting of the tablet and checking weather when it´s cold and dark outside. But it´s also great to sneak into the farthest corner of the dining area and do the same. Again, also to stretch out in front of the small chart table would be more than cool. Somehow I don´t get the layout of this Swan 65. But I fear there´s no concept in all this. I found it particularly confusing. Might be that on this boat more than 10 people roam about. Okay, in this case the owner´s family might be happy to have so many possibilities to have the people sitting down. In my opinion, it´s oversized. The boat simply cannot cope with the amount of given volume. Which is a different story with the cabins. These are huge and welcoming, especially the owner´s cabin in the front is offering loads of volume. I was impressed by the huge headroom which felt like way over 2 metres in height. The island bed is a true island: The bed can be entered from three sides to the whole length. There are lockers and cupboards and also nice hull windows which might offer a great sight to the anchorage from the bed. Huuuuge headroom in the owner´s cabin. What was a bit missing was the maritime style. The interior design was somewhat disconnected from sailing, ships and water. The joinery is beyond doubt spotless, of course, but I again didn´t feel that I was on Swan, in this case, even worse, that I was on a yacht at all. 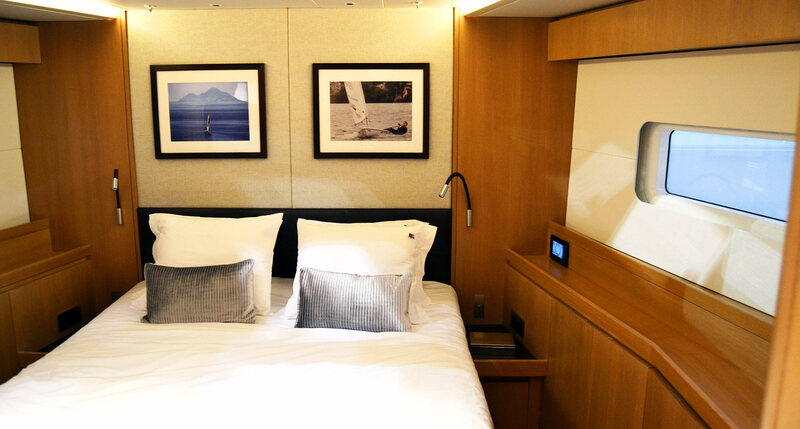 If the boat show crew hadn´t been putting pictures of sailing boats to the bulkhead this cabin might also have been a bedroom of a New York City hotel. Again, this owner´s office appears too tiny in relation to the volume of a 65-footer. I know, I am ranting a lot here, but I cannot help: This “office” in the owners cabin is for my taste too small. Even if one would assume that today´s people are working solely with tablet or Laptops, this office space is way too small. 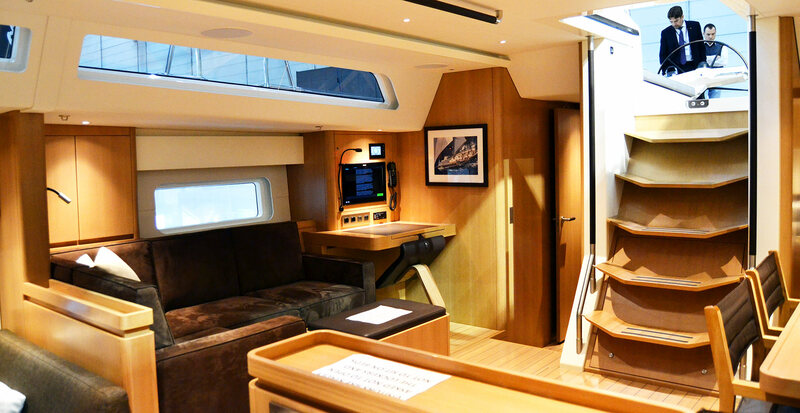 It would be too small for myself and keeping in mind the fact that the Swan 65 is a 65 feet yacht, I would reckon that instead of having this teeny-weeny office another cupboard or a larger bathroom would have been the better design choice. What is this new Swan 65? So in the end my feelings about the new Swan 65 are mixed. She is a really proud ship, fast sleek lines for sure and powerful data which indicate quick sailing and even serious racing, but for my taste this boat cannot deliver the “Swan-feeling”, this distinct notion of Nautor´s product. In fact, her smaller sister, the classy Swan 54, is in this matter way better and a “true” Swan in my eyes. Maybe the new 65 is too ambitious in breaking new frontiers? She is a fast sailing yacht though and she will certainly attract people! I wouldn´t say so, because from my point of view, the Club Swan 50 designed by Juan K did break new frontiers and she did it in the best way possible: Her style, her fittings, her character … everything about the Club Swan 50 was just perfect. It´s a pity to say this, but the new Swan 65 wasn´t “my” boat at all. But I am sure there will be others who fall in love with this new Swan and find their perfect dream yacht in her.